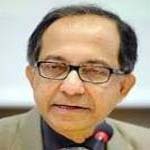 Basu, Dr. Kaushik is a Professor of Economics, the C. Marks Professor of International Studies and Director of the Program on Comparative Economic Development at Cornell University. He is a development economist whose current research focuses on political economy, knowledge and rationality and labor markets in developing countries. Dr. Basu is a member of the advisory committee on child labor statistics for the International Labour Organization (ILO). He also served as a member of the Expert Group on Development Issues for the Government of Sweden, Ministry of Foreign Affairs during 1997-2003. Prior to this, Dr. Basu was the Founder (1992) and Executive Director (1992-1996) of the Centre for Development Economics at the Delhi School of Economics in Delhi. He is the editor of Social Choice and Welfare and has been an associate editor for the Journal of Economic Perspectives and the Journal of Development Economics, along with editorial positions with a number of other journals and publications. From 1994-2003, he served as an associate editor of the World Bank Economic Review. Dr. Basu’ most recent publications are India’s Emerging Economy: Performance and Prospects in the 1990s and Beyond and Collected Theoretical Papers in Economics, 2 Vols. He currently writes a monthly column for BBC News Online.